I hope we eventually get that Hoist and Sideswipe... somehow... somewhere. wj88. I always appreciate your insights, but please don't bring politics into this. I am unique in that I am apolitical. As a citizen of the United States I have never registered to vote, and never will. I have known since I was a child that the system is broken, and just work to be the best person I can to make where I live a better place. Every comment I see in the news targeting one party or the other only makes them more abhorrent to me. You being a Canadian citizen I'm sure can appreciate that. Also again, I only go by what I see. I didn't say I had the answer, and I know you don't either. I just see what I see. maybe Hasbro just flat out slowed production of PotP at the factory level in favor of SS, who knows. I just see stores flooded with this new brand of toy SS toy product, and the one I wanted, basically not there. I wish someone at Hasbro was accessible so it could be explained. Occam's Razor is my favorite tool to address a proverbial Gordian Knot! I just realized something with Inferno: this is a missed opportunity to make a "G1" Infernocus. Really, Inferno --> Infernocus, and his limbs could be the Infernobots. 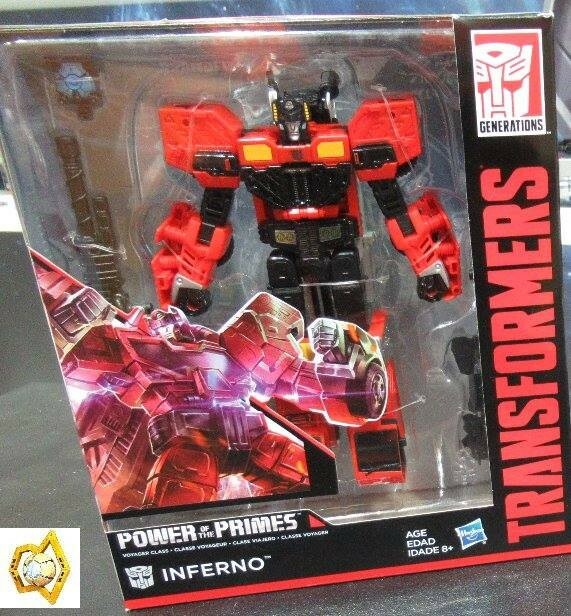 D-Maximal_Primal wrote: I just realized something with Inferno: this is a missed opportunity to make a "G1" Infernocus. Really, Inferno --> Infernocus, and his limbs could be the Infernobots. Actually, it would be kind of fun if Hasbro did a Studio Series Infernocus box set. They could do it just like the TLK one for TRU, but now that we have deluxe sized G1 Terrorcons with Power of the Primes, they could just repaint them as they did the Legion sized versions from Transformers Prime: Beast Hunters and make a new mold for the torso, in this case a new Voyager sized mold. It would be in keeping, somewhat, with Hasbro's mission to keep robot mode characters in rough scale with one another for the Studio Series. A CW sized Infernicus would still tower over most single bots, even leader sized ones, which should be "big enough" for the right sizing effect. Last edited by Wolfman Jake on Tue May 15, 2018 5:39 pm, edited 1 time in total. Actually, it would be kind of fun if Hasbro did a Studio Series Infernocus box set. They could do it just like the TLK one for TRU, but now that we have deluxe sized G1 Horrorcons with Power of the Primes, they could just repaint them as they did the Legion sized versions from Transformers Prime: Beast Hunters and make a new mold for the torso, in this case a new Voyager sized mold. It would be in keeping, somewhat, with Hasbro's mission to keep robot mode characters in rough scale with one another for the Studio Series. A CW sized Infernicus would still tower over most single bots, even leader sized ones, which should be "big enough" for the right sizing effect. I also realized something, which you sort of touched on: the original Infernocus did use the Prime Terrorcons as limbs, so in theory, this "G1" Infernocus could be Inferno with Terrorcon limbs, thus arriving at an Infernocus! Cool name for combined mode! Ha. As for the beast repaints, I'm much more cheering for Monstructor and Dinoking repaints and retools before movie Infernocus toys. Plus the last two femmebots from the show. Heck, I'd take a repaint as Arial with the robo-ponytail, too. What do you do, call a travel agent and say, "send me where the new Transformers are"? That's a heck of a service, but eBay is probably cheaper. ... No comments on how Takara Inferno uses Starscream's Foot Armor and not Hun-Gurr's? JelZe GoldRabbit wrote: ... No comments on how Takara Inferno uses Starscream's Foot Armor and not Hun-Gurr's? Hasbro is using the same foot, they just used the wrong one in displays and box art. Where does hasbro suggest putting the enigma of combination then? I don't know why they've included one if it can't be used in the gestalt form. ZeroWolf wrote: Where does hasbro suggest putting the enigma of combination then? I don't know why they've included one if it can't be used in the gestalt form. I wonder if they put a hexagonal port on the back so you could pop it on the same way you would legends Groove. It would look lame, like he had a crumb stuck to his belly, but I could see it. o.supreme wrote: wj88. I always appreciate your insights, but please don't bring politics into this. I am unique in that I am apolitical. As a citizen of the United States I have never registered to vote, and never will. I have known since I was a child that the system is broken, and just work to be the best person I can to make where I live a better place. Every comment I see in the news targeting one party or the other only makes them more abhorrent to me. You being a Canadian citizen I'm sure can appreciate that. Also again, I only go by what I see. I didn't say I had the answer, and I know you don't either. I just see what I see. maybe Hasbro just flat out slowed production of PotP at the factory level in favor of SS, who knows. I just see stores flooded with this new brand of toy SS toy product, and the one I wanted, basically not there. I wish someone at Hasbro was accessible so it could be explained. And in return, I appreciate everything you bring to these boards as well. I didnt mean to get political but I was looking for an anology of people saying a bunch of things but it not being backed up and I knew if I said something like "earth is flat" it would be dumb and demean what you were saying which is never my intention. Its pretty cool that you are apolitical and I respect that. From an outsider looking in, the USA looks nuts on both sides. Not in the values but in how people treat eachother. The Left only shows the worst examples from the right and vice versa, making it hard for anyone to get a well rounded idea at what the political parties entail. I just sense so much hate and disgust. I mean, you are all in this together, none of that helps. So yes, I completely see where you are coming from. Moving on, I actually do know someone who is in charge of merchandise (like what is stocked) at Walmart, at the corporate level. I dont know if our questions will be too micro for her, but we will see. From what she told me in the past, its usually up to whatever the supplier gives when fulfilling a SKU. So either Walmart didnt order more of Generations in General, or they arent getting any at the moment from hasbro. It does bring us at the same spot right now, but it would be good to know what the usual trend is. And yes, the number of people making these toys is finite so they cant make everything at the same time, thats a good point. william-james88 wrote: Moving on, I actually do know someone who is in charge of merchandise (like what is stocked) at Walmart, at the corporate level. I dont know if our questions will be too micro for her, but we will see. From what she told me in the past, its usually up to whatever the supplier gives when fulfilling a SKU. So either Walmart didnt order more of Generations in General, or they arent getting any at the moment from hasbro. It does bring us at the same spot right now, but it would be good to know what the usual trend is. And yes, the number of people making these toys is finite so they cant make everything at the same time, thats a good point. I posed to Scotty that the Twincast Look into doing an interview segment with Hasbro and or someone iin the retailer side. It could be a dry topic, and they may not be ab;e to answer a lot of questions given trade secrets, but this topic of “Dude, where’s my Transformers?” Seems to come up a lot and maybe they could shed light on wave breakdowns and why like, for example TR W5 got run over by the Revision Case instead. Or why we are still not seeing W2 of PotP in saturation yet. One question: seems like we got W1 hella early. When SHOULD we have been gettting W2? Is there a “Street date” for these that just got flat out ignored? Thing about this stocking stuff too is we don’t know where the breakdown is. If there even is one. Even if Walmart Corporate is ordering and receiving W2, that doesn’t to my VRY limited understanding get distributed evenly across the regional hubs. And they in turn don’t distribute consistently across the local hubs, but restock those hubs whenever they order. And in turn, the physical stores get their stock from the local distribution as needed, not universally. So a systole that sees a lot of collector traffic is getting TFs more frequently than another in an adjacent area. And it could be, if Generations restocking IS slowed down by Hasbro or the retail corporate, demand could be siphoning the new stuff to certain regions and specific areas before saturation can take hold in other parts of the country. But even if that IS the case, it seems a new trend and still comes back to the question of is Hasbro not producing as much, or is it not being ordered as heavily? Or what? Does that rambling even make sense to anyone else? I still don't believe that hasbro will have slowed production down, as I say they want both products to sell. Just got back from my local toys'r'us here in Switzerland after hunting for some POTP figures. I'm not really all that interested in any of them, but was curious to see what they had. To my shock they were still selling Combiner Wars figures, at full price! No idea if Transformers are selling this badly here or if they just didn't bother ordering anything. Regarding the enigma and other trinkets... I wish this third of the trilogy would have had more insight and lore around the bits and bobbles. Having some comics or bios or a paragraph on the box detailing what swapping out a little cube would do to a gestalt would make me more excited about them. That said, I wish we got more of the various objects from the shows. I'd love to see a concerted effort to create the artifacts and parts from Transformers history in the upcoming line. Seems like it would be a good fit. Secondly, Flashwave. yes I'd love some insider info, whether it be from Hasbro, or a distributor, or a retail insider from someone high up at Walmart, Target etc...to really understand what the ordering process is, why things happen the way they do, and the "best way" (if there is such a thing) to obtain the toys we like, preferably at MSRP or less . I've heard dozens of theories. Some make sense, and some don't. I believe in equal distribution, worldwide if possible, I know that may not be realistic, but obviously since the topic comes up so often, I think it would be fascinating to get some real information. Yeah, I've actually given up finding toys locally now. Pretty sad day to just accept defeat and stop shopping. Finding toys on the shelf always was an exciting thing. As for what I'd ask Hasbro, still popping up in my mind is what the designers intended for these recent gestalts... their names, personalities, configurations. We've gotten three released with no logic to their limbs, and no names for the combined mode. I know SOMEONE on staff has to have had a plan for these... even if it derailed on the way out the door. Well I know the Enigma was part of the whole Botcon 2016 Build-a-Figure package. So the mold is there for future use. Some of the other relics you mentioned started out as MiniCon teams in Armada, so 8technically* they have appeared before, sure not as the Cybertronion relics we know now...but the next line may look into these more, or a 3P company may even now be developing them. Still a reasonably priced Generations "accessory pack" of sorts I think would be a novel idea. It worked for Motu back in the day. o.supreme wrote: Well I know the Enigma was part of the whole Botcon 2016 Build-a-Figure package. So the mold is there for future use. Except that particular Enigma accessory wasn't a Hasbro piece. Each one was handcrafted by Japanese fan Myu, so Hasbro wouldn't have access to that accessory. There were lots of Star Saber accessories released in the TF: Prime toylines. With this line being themed around the Thirteen Primes and their personal artifacts, this would be the ideal line for them to be in. But my point really is wanting to see Hasbro approach them as a collection of artifacts UNDER ONE LINE so they match and look good together and make sense. (As opposed to a bunch of jet minicons stuck together... and a white 3-d printed thing... and a repainted Bayverse sword... and a...) Ideally, they'd all be part of a quest or plot device for the line, spelling out an exciting, planet-spanning, time-traveling treasure hunt. But you are right that it's unlikely. There IS probably a better chance seeing it out of a third party than Hasbro going that route. Here's hoping they at least nail the G1 cybertronian modes from the early cartoons. I know those Tetrajets have been hard to pin down in toy form.